May all your weeds be wildflowers. This image is available for license here. 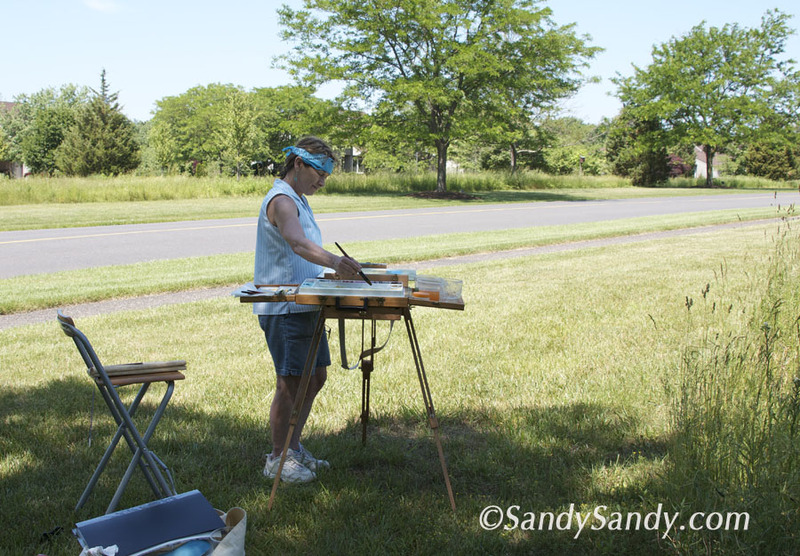 Yesterday I competed in the Medford NJ, "2013 Paint Our Town - Plein Air Challenge". Although temperatures soared into the mid 90's, I managed to find a shady spot and held up pretty well. This year the event took place on the Medford Leas Retirement Community's 160 acre impressively landscaped grounds. It was lots of fun and a very well run event. Upon arrival, our painting surface was marked and we were supplied with maps and information about possible painting locations. I learned so much, on many levels through participating. 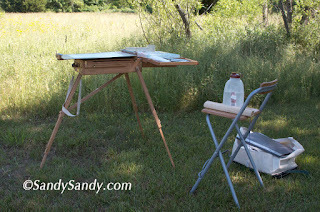 I haven't really painted on location in years and setting up and working outside is not like being in the studio where everything's at your fingertips! The only thing I forgot was a spray bottle and my paints kept drying out. I'm planning on putting together a "Checklist for Plein Air Watercolorists" in my next newsletter. Be sure to sign up to receive it in your inbox. 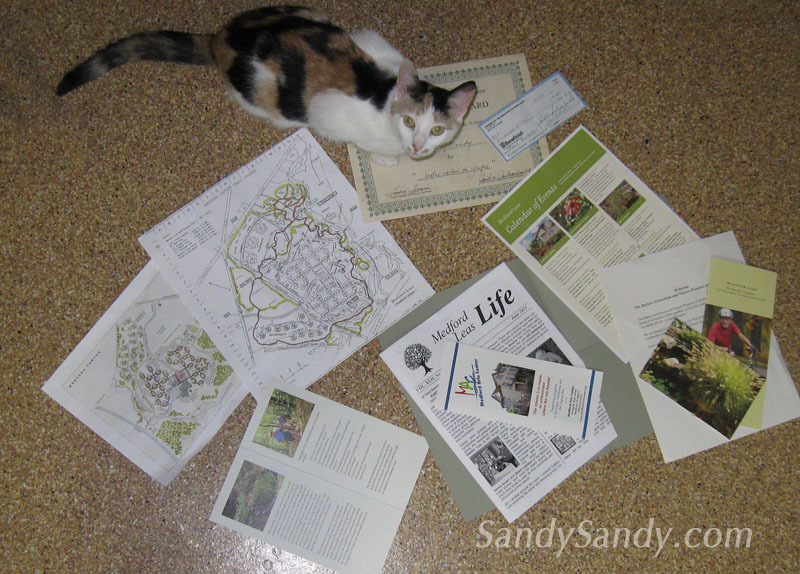 who contributes to the community newsletter. It was really good for me to get off the property. I tend to be a hermit. Most days, I'm here in my studio, painting, on the computer or hanging out with my critters. It was good to get out in public and it was definitely good to get out of my routine and comfort zone. Even though it was a lot of work, I'm charged up to do it again, hopefully when it isn't so darn hot. Cutie Pye inspects the maps, brochures, and winnings. Everyone I met or was reacquainted with was so nice! There was even a reception with food and wine after the judging. 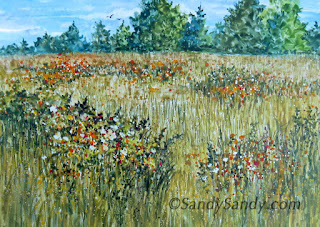 I am happy to report that I got a second place award and a cash prize for my painting of Katzell Meadow, titled "In The Meadow". That was just the icing on the cake though. 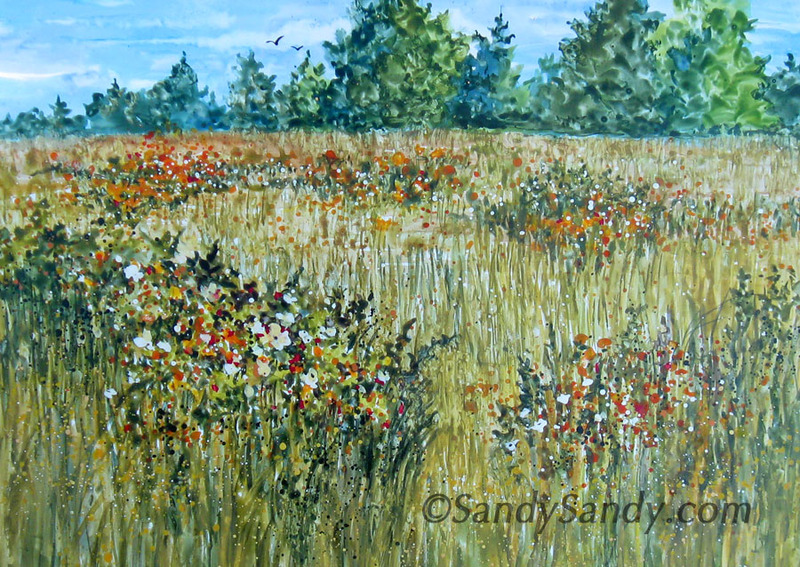 The true prize was just being there in the moment, observing, feeling, painting, outside, in the zone, in the meadow. out of your comfort zone or routine? As Always, I'd love to hear your thoughts! 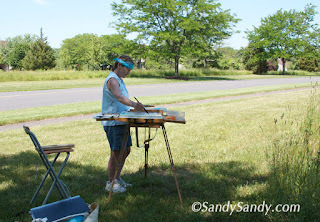 This sounds like a great day of painting, even if it was so hot! Your painting is wonderful, I absolutely love all the flowers, and it must have been so nice to paint in such a great location. Many thanks for taking the time to comment here, Sue. I know you don't usually go on Blogger, so your comments really are a special treat. I really appreciate all your feedback! Thank you very much!! Hi Sandy. I laughed when I read your comment. Your "most days" sound like my "most days". :) It sounds like you had a great time. Maybe I could try getting out more, too.